You may remember the two major ongoing market stories in 2018 that consumed our newsfeeds, and brought uneasiness to investors: One was, using President Trump’s words to describe it, “the Fed is so tight”. The second was Trump’s unilateral trade war with China. These two stories were such strong forces that they arguably were responsible for 2018’s two market corrections. Because of the Fed, massive withdrawal of liquidity was induced by a combination of interest rate hikes and balance sheet reduction at the US Federal Reserve. Because of Trump’s trade war with China, the markets had to confront the chain disruptions. As monumental as those two forces seemed only months ago, their influence is now lessening, turning them into relatively harmless, lingering ghosts of 2018. For one, the US Federal Reserve has made an unusual and rapid U-turn on monetary policy. In short, the Fed has caved, and is now facing economic realities and acknowledging broader developments, such as the trade war being a risk to the economy. On the trade war front, markets have become desensitised to Trump’s jolts that littered 2018. While it’s unlikely that the trade war will resolve any time soon, we will likely see a face-saving deal between the US and China. It’s also likely that trade tensions will flare up again as we approach the US’ presidential election in 2020. Although Trump has recently shifted his tariff focus from China to the EU, as he’s ruffled by Europe’s subsidy of Airbus, the markets won’t react the way they did in 2018: they have seen this behaviour from him before, and so now know to be cautiously optimistic and not overly complacent, and this will ultimately reduce the extent of any short-term negative reactions. Beyond geopolitical issues and the Fed, we are seeing green shoots sprouting in a number of economies. The first positive surprise came from China, which received a 50.8 figure in March from the much-watched Caixin PMI (Purchasing Managers Index). A figure above 50 indicates that businesses are expecting some growth of future industrial activities. This 50.8 print marks a meaningful reversal from China’s recent low of 48.6 just two months before in January 2019. In Europe, production data have shown a slump in the bloc’s manufacturing sector, but the services sector have been chalking up good numbers. In fact, the service PMIs for four of the biggest economies in the Eurozone (Germany, France, Spain and Italy) have all exceeded economists’ expectations. Overall, this has stabilised the Composite PMI for the Eurozone, indicating that the aggregate Eurozone economy is stabilising. In the US, leading indicators, such as the Conference Board’s Leading Economic Index (LEI), which is used to forecast future economic activity, have declined, but have done so from a high bar. Specifically, the Conference Board LEI’s annual rate of growth peaked at +6.6% in September 2018. It has since tapered off to +3% YoY. You can interpret this change to mean that the world’s largest economy is still growing, just at a more moderate pace. Good news is that the market is a fast-moving voting machine, and reacted to this negativity back in late 2018. Yet, the US stock market held up above bear market territory and defied sentiments to deliver a big rebound in 2019. It’s hard to dispute the media’s propensity to continually turn out negative spins on news. Perhaps bad news sells better, but in the end, the markets knew better. Markets cut through the noise to hold their own: As shown in Figure 1, growth-oriented assets have defied the media’s incessant focus on negativity, leading to a remarkable outperformance on a year-to-date basis in 2019. Take small-cap growth stocks as an example. This segment of the stock market is often considered risky and more vulnerable to an economic slowdown. Yet, it went on to deliver a YtD return of +21.6%. Let’s also look at the resilient US technology sector: Due to a number of mortifying data breaches at firms, such as Facebook, regulatory pressures have heightened, and up-and-coming candidates for the US 2020 general election are ready to use the opportunity to win some votes. And through it all, the US technology sector delivered +22.8% in YtD return. The Fed’s U-turn to slow down interest rate hikes has provided a big boost to interest rate-sensitive assets. As a result, real estate investment trusts in the US, Asia ex-Japan region, and Singapore have all performed well with YtD returns of +17.4%, +11.5%, and +11.3%, respectively. Stock markets in China and South Korea have been vulnerable to Trump’s trade war. But, they have rebounded strongly as active trade talks between the US and China are starting to deliver more and more ‘face-saving’ progress. The rebound in China and South Korean markets have in turn lifted the Asia ex-Japan equities by +15.4% YtD, as the Asia ex-Japan region has approximately 33% and 14.8% of exposure to China and South Korea, respectively. For Asia ex-Japan equities, its YtD returns of +15.4% is a far cry from the -13.8% for the full year of 2018 when trade tension was escalating. Looking at the last few months, sector performance has been quite volatile. But investing is inherently volatile, no matter the economic conditions. Market unpredictability manifests as market volatility, and tolerating the volatility is why we get compensated with asset returns. But earning that upside requires investors to stay in the markets long enough to see beyond the short-term volatility and experience the long-term upward trend of the markets. The only way to reap the benefits and realise this compensation is to stay invested and let time do the compounding. The costliest mistakes for investors is to respond to market volatility: too often we see investors chasing the highs for fear of missing out (FOMO), only to cash out too late. It’s also damaging (and unfortunately common) for investors to withdraw when they get nervous about short-term lows or negative returns, a response commonly known as the fight-or-flight. At the end of 2018, when the markets were not performing well, we reminded our customers to stay invested in the markets and to maintain their dollar-cost-averaging plans to buy into the markets when they’re low. 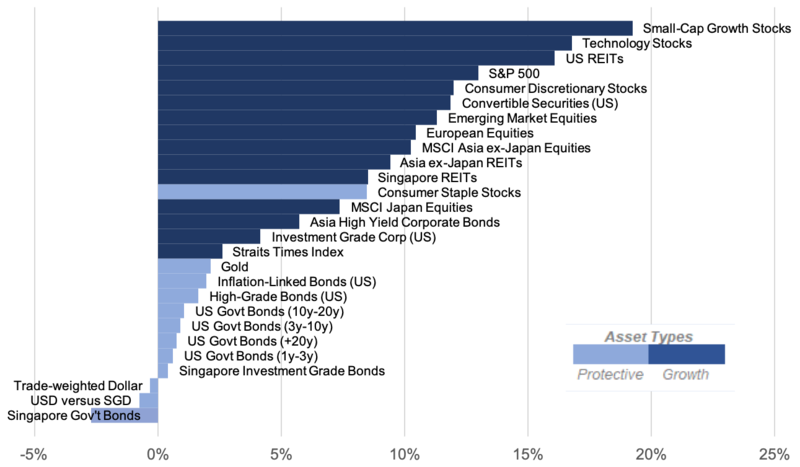 Today, on the other side of the same coin, we cannot emphasise enough how important it is not to get over-excited about amazing returns YTD, to stay invested, and to keep dollar-cost-averaging by sticking to your plans. Don’t try to “sell at the peak”, but also don’t bet the house on the fact that the rally will continue. Just stick to your plan. The two market corrections of 2018 with the subsequent large positive reversal of markets this year have perfectly illustrated the importance of sticking to our investment plans: at the risk of being boring, our recommendation will always be to ride the natural ups and downs of the markets. Building wealth is a marathon: choose your pace and stick to it. If you feel uneasy about the short-term ups and downs, then it’s time to reevaluate how much risk you’re taking. Taking on more risk than what is necessary to achieve returns, or that is uncomfortable for you, only hurts you.